I was partnered with Mary from Mary's Marbles for this swap. I had the chance to get to know her a bit and I had fun picking out items to include in her swap package. The BEST part of being partnered with Mary? We live 20 minutes away from each other!! Since we live so close to each other, we decided to have a blate (blog date) and swap our packages in person. I had a fantastic visit with Mary (and one of her daughters). It was so great to see and chat and ger to know each other even more. So, what did Mary give me? The mug says "All you need is tea and warm socks". While I do drink coffee, I am more of a tea drinker, and I told Mary after she gave me this mug that I loved the fact that she was able to find and gift me with a mug that had a quote about tea- most mugs have quotes that deal with coffee. Maeve Binchy is one of my all tiem favourite authors and Minding Frankie is one of her books that I have yet to read. I was ecstatic that Mary picked out this book for me!! I can't wait to read it!! I love having a nice smelling apartment, so I frequently have wax tarts melting. Mary got me 'Sweet Sangria' wax tarts...which smell amazing!! She told me that she saw that in 2011 I had posted a recipe for Sangria on my blog (which, for the life of me, I cannot find) so she thought I would like this scent! Finally, Mary gave me these beautiful bracelets. They are made by a company called Color by Amber and are made using recyclable, eco friendly material. One of the bracelets has grass in it from Africa- how cool is that?? ?- and one of the bracelets is clear; it's called clarity...which I love! Huge thank you to Mary for spoiling me!! Head over to her blog to see what I gave her. Also thanks to Angie and Beth from Chaotic Goddess Swaps for hosting!! The bracelet with grass from Africa is really cool. A 'Sweet Sangria' candle tart sounds like it smells really good! Aw, it's so cool that you live so close together! Looks like she picked out the perfect goodies for you. Love that mug!! 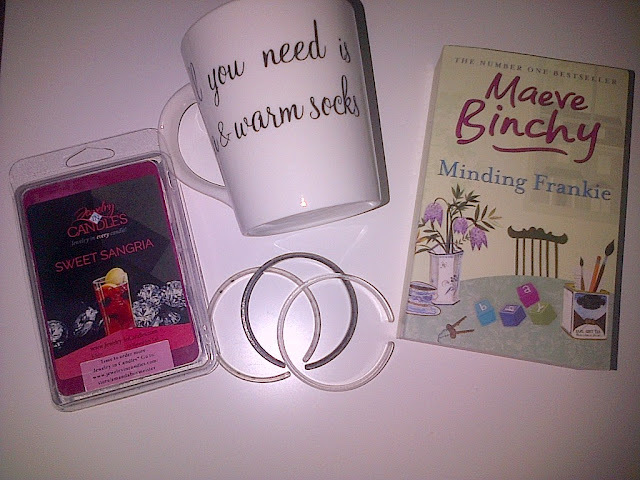 Super prezzies! I'm linking over from CG Swaps, and I do like that the mug is for tea (we drink more tea than coffee around here). I had to laugh at y'all having a blate! It's fun meeting bloggers, isn't it! They're the nicest people! I love Maeve Binchy. I think you'll enjoy Minding Frankie. Oh how cool! You got to meet your partner. I love the swaps Beth and Angie host. It is a great way to get to know other bloggers. It looks like you scored with your package. How great that you actually got to meet in person to exchange your gifts! What a thoughtful gift, and how neat that you live so close and were able to meet up. I love Maeve Binchy books too. What neat bracelets as well! Yay for a Maeve Binchy novel and what sounds like a lovely scent for your wax warmer!